A key sailing manoeuvre, tacking is used to change direction by taking the bow of the boat through the wind, and requires good coordination between helm and crew (if any). Tacking is usually carried out to move from one close hauled course to another to sail upwind (known as beating a course). These are the steps to go through when tacking in an aft main boat, such as an Enterprise, GP14 or Mirror. 1. The helm prepares to tack by checking the course is clear. When ready, the helm calls "ready about", at which point the crew (if any) checks for other boats, and replies "ready", and uncleats the jib but does not adjust it at this point. The helm should be holding the tiller extension in a pan handle grip, ready to transfer hands with the main sheet. The crew should also ensure the centreboard is fully down, which acts as a point for the boat to pivot around. 2. The helm should change his hands around with the main sheet and the tiller extension. 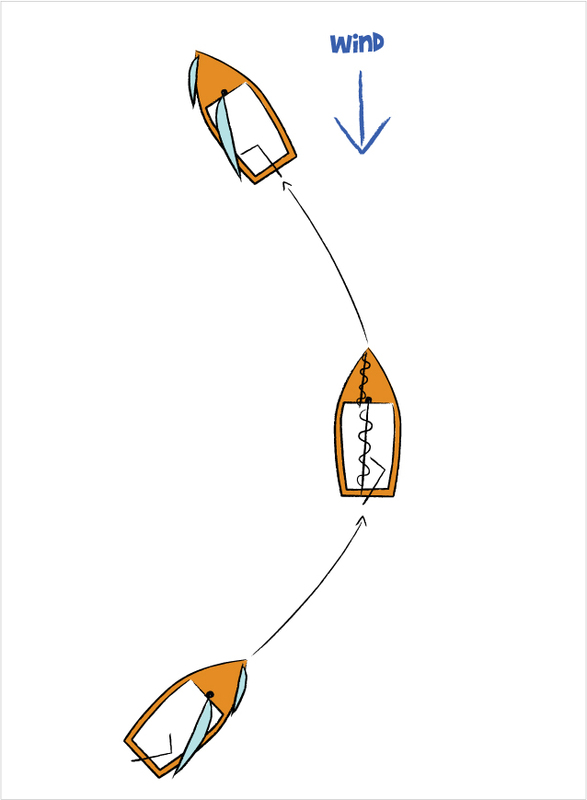 To do this, bring the main sheet hand towards the tiller, trap the main sheet under the thumb of the hand on the tiller, and now you can take the tiller in the other hand (trap change push), call "lee-oh", at which point you push the tiller away from you to leeward (the side of the boat the sail is on) and moves front foot forward into the middle of the boat. The jib should be flapping at this point, when the crew should release the current jib sheet and pick up the opposite one, and prepare to move across. 3. As the bow (front) of the boat turns into the wind and goes head to wind, the helm should keep the tiller pushed across and moves across the boat, facing backwards all the time. The crew smoothly moves to the middle (no sudden movements) and gets ready to pull the new jib sheet in. As the boom moves into the middle of the boat, the helm should duck under the boom facing backwards and allow the boom to carry on over to the other side of the boat before moving. 4. The bow of the boat moves through the wind, and the helm completes moving across and sits on the side of the boat opposite the sail again (the new windward side). The crew sheets in (pulls in) the new jib sheet, and moves over to balance the boat as necessary. The helm should keep the tiller extension over to continue the turn. 5. As the boat moves onto it's new course, the helm trims the sail and straightens up the tiller. If the trap change push was done correctly, the tiller extension and main sheet should be in the correct hands (tiller extension in the backward hand and mainsheet in the forward hand). 6. Now on a new course, if sailing close hauled, keep an eye on the jib - flappy is unhappy; when sailing too close to the wind, the jib will start to flap and lose power and the helm should tweak the tiller towards them to push the boat away from the wind slightly. - Push the tiller extension away from you. These are the steps to go through when tacking in an centre main boat, such as any new Laser, Topper or RS type dinghy. 1. Helm prepares to tack by checking the course is clear. When ready, the helm calls "ready about", at which point the crew (if any) checks for other boats, and replies "ready", and uncleats the jib but does not adjust it at this point. The helm should be holding the tiller extension and main sheet in thumbs up grips, tiller in the back hand, and the main sheet in the front hand, ready to carry out the tack. The crew should also ensure the centreboard is fully down, which acts as a point for the boat to pivot around. 2. Unlike aft-main, the helm does NOT change hands over until the maneovre is almost complete. The helm calls "lee-oh", at which point he/she pushes the tiller away from them to leeward (the side of the boat the sail is on) and then moves back foot first into the middle of the boat. The jib should be flapping at this point, when the crew will release the current jib sheet and pick up the opposite one, and prepare to move across. 3. As the bow of the boat turns into the wind and goes head to wind, the helm should keep the tiller pushed across and moves across the boat, facing backwards all the time. The crew smoothly moves to the middle (no sudden movements) and gets ready to pull the new jib sheet in. As the boom moves into the middle of the boat, the helm should duck under it facing forwards and allow the boom to carry on over to the other side of the boat before moving. 4. The bow of the boat moves through the wind, and the helm moves across and sits on the side of the boat opposite the sail again (the new windward side). The crew sheets in (pulls in) the new jib sheet, and moves over to balance the boat as necessary. The helm should keep the tiller extension over to continue the turn. 5. The helm should now be sat on the new side, with the tiller extension behind them (known as thumb to bum); they should hold this position until the sails are set correctly. When comfortable, the hands should be swapped. IMPORTANT: DO NOT change your hands until you are on your new course, and sailing along. You can sail along for quite a distance with your hand behind your back sailing, when you are comfortable, then change over. 6. To swap the hands over, your front hand should be behind you, still holding the tiller extension, and the back hand should be holding the mainsheet. Bring the front hand back across the front of you, to take hold of the tiller extension. Then, release the tiller with the front hand, and bring it around in front of you to take hold of the mainsheet. When complete, you should be back in the thumbs up grip. IMPORTANT: Also, make sure you change over hands, bring the rope hand back through, and then, swing the tiller under your arm to bring it through. If you bring them through at the same time, there is a chance you'll get all snagged and tangled up. 7. As the boat moves onto its new course, the helm trims the sail and straightens up the tiller. If the maneovre was done correctly, the tiller extension and main sheet should be in the correct hands (tiller extension in the backward hand and mainsheet in the forward hand). 8. Now on a new course, if sailing close hauled, keep an eye on the jib - flappy is unhappy; when sailing too close to the wind, the jib will start to flap and lose power and the helm should tweak the tiller towards them to push the boat away from the wind slightly. - Forward Facing - remember that to change sides, you should be forward facing for centre main boats, rather than facing backwards, or you'll get in a mess! - Keep your ropes tidy - if you don't, chances are they'll end up snagging on something at the worst possible time! The above may sound complicated, but after enough practise, it will all become second nature and you'll do it without even thinking about it!